The Dreamer crystal side comb is filled with the spirit of an enchanted sky. It’s adored for its botanical vine-like details in a clean and sleek silhouette. It’s the perfect piece for modern romantics and brides looking for a unique take on the traditional bridal comb. 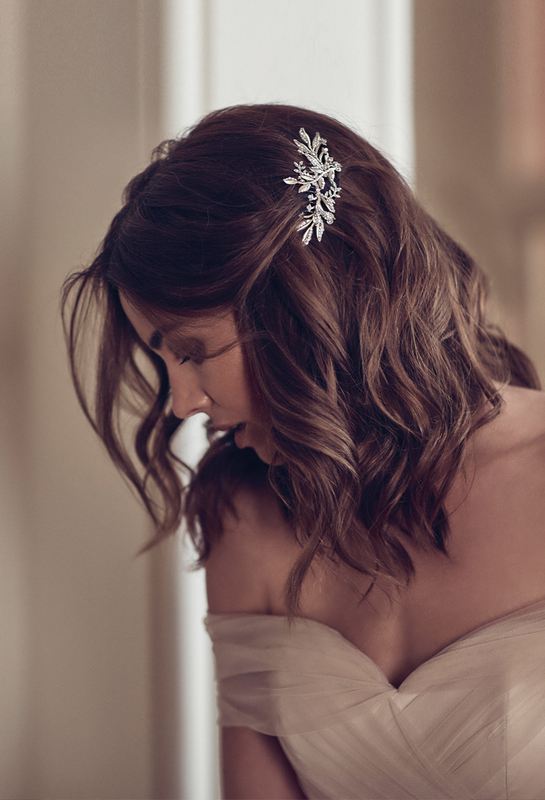 A modernised gilded metal comb finished with Swarovski crystal details, it’s a wildly romantic piece that’s perfect for side swept looks or tucked into a romantic updo. Star Gazer birdcage veil sold separately. The Dreamer comb is ready to ship. Please allow 5-7 business days for processing plus delivery times. The Dreamer comb was designed to sit flat against the hair so it’s the perfect piece for loose waves pinned to the side near the ear. It can also be styled with romantic updos or chignons with the comb nestled to the side or just above. We adore Dreamer’s simple and elegant details as it complements most silhouettes, necklines and bridal hairstyles. For an ultra glamorous look, pair the Dreamer comb with a classic chapel length wedding veil, drop veil or birdcage veil, such as our Star Gazer crystal birdcage veil. After the ceremony, you can simply remove the veil and your hair will still be perfectly adorned. Silver crystal details pair beautifully with lace wedding dresses and gowns with silver beaded details. Dreamer features unique vine details which add a feminine touch to modern, traditional and vintage looks. If worn with a veil, pair it with a veil with minimal gathers at the comb for a more seamless finish. Browse our full veil collection or contact us and we’d be happy to offer a recommendation to suit the Dreamer based on your wedding dress and hairstyle. Details can be reworked into a new style – for example, a hair pin set, headband or wedding crown.